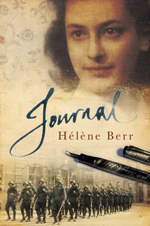 Between April 1942 and February 1944, Hélène Berr, a young Jewish graduate, kept a diary, a moving and harrowing account of living day to day in profound anguish and fear in german-occupied Paris. Despite the risks to her safety and that of her family, she clandestinely worked to save Jewish children by escorting them into the Free Zone. Hélène Berr was arrested on the night of her twenty-third birthday, in March 1944. She survived eight months of Auschwitz and almost five months of Bergen-Belsen, before being beaten to death for being too weak from Typhus to get up from her bunk – only five days before the liberation of the camp. “Journal” is the heartbreaking testament of a remarkable young woman, and a unique chronicle of the French Holocaust.